The 2008 Royals were twelth out of 14 AL teams in OBP. So what did the Royals do to address the problem? They kicked off the trade season by dealing for Marlins 1B Mike Jacobs, that’s what. Jacobs hit a career-high 32 homers this season in 141 games, although he batted just .247 with a .299 on-base percentage. How bad is Jacobs at getting on base? He walked just 36 times last year, and his .299 on-base percentage was the seventh-lowest in baseball among players with 500 or more plate appearances. Mike Jacobs is not a good baseball player. He’s just not. Jacobs’ career OPS+ is 110. That number almost perfectly describes Jacobs’ current abilities, as he has been quite consistent. Here are his OPS+ numbers for the past three years: 106, 100, 109. Good for a hitter, but not for a hitter who plays first base. Yes, he did hit 32 home runs last season. To be a good hitter with a .299 on-base percentage, you have to hit at least 40 homers. Maybe 50. Jacobs’ acquisition should lead to more homers, which couldn’t hurt, since Kansas City was 13th in the AL in homers in 2008. But odds are he’ll be hitting a lot of solo shots, because Kansas City isn’t very good at getting on base, and adding Jacobs won’t change that. Hey, don’t get me wrong. Jacobs represents an improvement over Ross Gload and his three home runs and 37 RBI. But if you’re only objective is to find somebody better than Gload, then you’ve set the bar pretty low. If you get past Kansas City’s OBP troubles the team isn’t so bad. Not so good, either. But not awful. Kansas City gave up the fifth most runs in the AL last season and the team’s defense was middle of the pack. The Royals would need a lot to go right in order to contend in 2009. A lot. 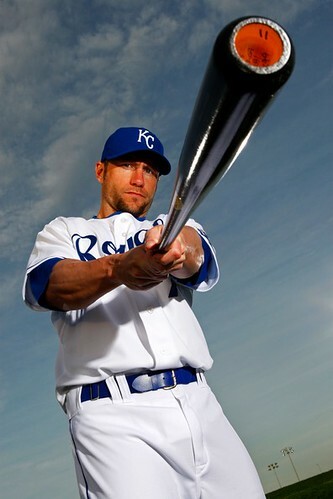 Alex Gordon, Mark Teahen and Butler would have to realize their potential and become the stars the Royals believe they can be. Gil Meche has to have a bounce-back year. Zack Greinke has to continue to pitch like an ace. Ditto Joakim Soria. A free agent like Jason Giambi could help the Royals, but Giambi is limitted to DH/1B and the Royals have a glut of players that play that position, including Billy Butler, Ryan Shealy, Gload and Kila Ka’aihue. Giambi would just add to that glut. The Royals will no doubt look to trade some of their 1B/DH depth. Butler has the most trade value, but the Royals would be selling low on a guy who only a year ago was considered one of the league’s brightest hitting talents. Ka’aihue has career numbers of .262/.382/.448 in seven minor league seasons, but he could start the year back in triple-A. What’s troubling about the Jacobs acquisition is that it suggests that the organization isn’t serious about improving the team’s OBP. And it needs to be serious about OBP, but the Royals’ OBP is a serious problem. Let’s face it. We’re all going to have to learn how to spell Ka’aihue. And it’s going to be a very bumpy ride. Gil Meche has to have a bounce back year? Bounce back from what? Once he got on track in mid-May he was better than Greinke. I’m not too worried about the pitching staff and the offense should be much improved when you take into account Alex Gordon’s second half (a rise in OBP correlates with a soon to come rise in power). The Royals are still a year away, but they’re making more progress than people want to believe. The thing to keep in mind is that when Dayton Moore took over in 2006, he was essentially taking over an expansion team. They were that bad. While fans are understandably frustrated by the 23 years of rebuilding, you have to discount everything before GMDM came on board and look at it as year two of a new plan, a better plan.